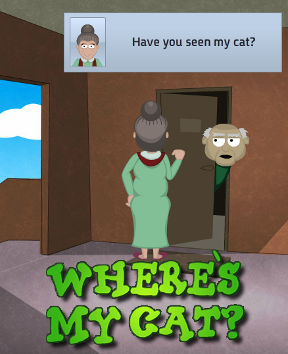 When Mrs. Glick loses her cat, use your sleuthing skills to help her find it in this pint-sized point-and-click adventure from OK Interactive. Get clues by knocking on doors and talking to quirky small town citizens, asking "Where's My Cat?" of everyone you encounter. Follow the map to the various locations where you'll search for useful objects. Use them bargain for more clues or to get through the barriers on your way to rescue kitty. The changeable cursor, straight-forward tasks and cleanly-drawn settings which usually make obvious all possible hiding spots means this is an easy case to solve. Much of the fun is in the conversations you have with the characters yet you really need an appreciation for this peculiar mix of lighthearted and gruesome if you're going to enjoy the story. At the end of the ten minutes it'll take to unravel the lost feline mystery, you may be shaking your head, squinting your eyes at the screen and grinning ear-to-ear all at the same time. But you know, there are times when weird is exactly the kind of break you need in the day. Where's My Cat? Walkthrough now available! 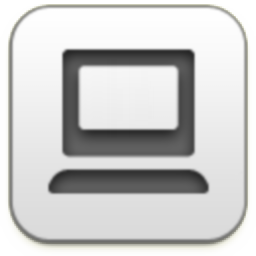 Music Note: to turn off the music, click the wrench icon in the upper left corner then select "music off." Get the SLEEPING PILLS PRESCRIPTION. Click the door on the right to exit the room. Your neighbor tells you that he saw the cat go to the vampire's (Mr. Robinson). If you are inside, you'll need to go through a door to the outside. Take the OLIVES from the tree outside the pharmacy. Then, click the door to enter the pharmacy. then click on the PHARMACIST to give him the prescription. You'll get a SLEEPING PILL. Click the door to exit back out to the street. While outside Joe's Place, notice that the utility pole has an interactive spot. This might come in handy later. Click the door to go inside Joe's Place. Pick up the ICE from the bucket in the lower left side of the room. Go through the door back out to the street and open your map again. Click on the AXE (tied to the pole of the meat stall) to find out grandma needs "something interesting" to trade for it. Highlight the BEER and then click on the ICE to chill the beer. Then, highlight the PILL and put it in the beer to get COLD DRUGGED BEER. Give the ice/sleeping pill/beer concoction to the doorman and he'll zonk out. Use the GARLIC from The Market on Mrs. Glick. Then, click the doors to enter the mansion. Give the dog the HAM BONE. Go through the door on the left. Plug its cord into the socket on the left. Go through the door on the right side of the room. Go past the dog through the double doors to exit the mansion. If you haven't done so already, get the SAW from out of the storm drain in the sidewalk. Use the SAW to cut down the utility pole. Go back into the chopping machine room (enter mansion then click door on the left). Use the AXE to cut the lock off the door on the left. Go through the new door. Feed the monkey the PISTACHIOS that Joe gave you. Click the door on the left. There's Mr. Robinson, snoozing peacefully with the kitty. What does Mrs. Glick do to save her cat? Use STAKE made from the utility pole to stab the vampire. Brrrr. That's one gruesome grammy! You saved Mrs. Glick's cat! Yeesh, I hope Mr. Robinson really was a vampire & not just a guy with off-color skin who likes to sleep in coffins. Of course he was. Why else would he own a giant dancing monkey? I have a suggestion for your walkthrough. The wording on #7 suggests that you can do that step before you have to read the spoiler inside it. Since I didn't want to accidentally see the answer to more than I needed, I kept going over steps 1-6, over and over, trying to see what I'd missed. I only figured it out by watching the game's video walkthrough. It could be better without the womans constant eye shifing and mouth movements. OK, really bad gameplay. Had no idea what the green things from the tree were -- no dialog appeared when she picked them. Guess it didn't matter as the machine wasn't an olive press. Also, why not have map constantly available once she's discovered it? Annoying to have to back out of the mansion to access other places. I'm pretty sure machine *is* an olive press and that the map *is* constantly available. I guess I was searching for a different cat.